Brush both sides of the prawns with the Sriracha sauce. Sprinkle the chipotle chilli powder on top of the prawns. Set up your barbecue for direct cooking. Please refer to your handbook for further instructions. Preheat your barbecue for barbecuing on high heat. 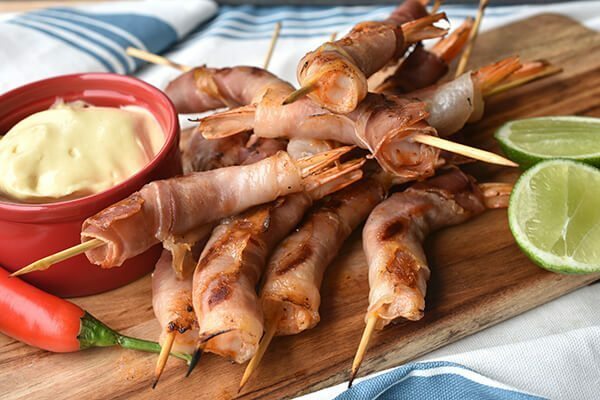 Wrap a slice of prosciutto around each prawn. Thread onto pre-soaked wooden skewers, 2 prawns per skewer. Once the barbecue has preheated, leave the burner control(s) on high.Place the prawn skewers on and cook for 4 minutes, turning the skewers half way. Serve with aioli.